Some of you may remember me raving about meeting Marisa Silver at Winter Institute 2008 — if not, Silver is the author of the excellent novel The God of War, recently released in paperback. The novel takes place on the shores of the Salton Sea, an inland saline lake in California, and the landscape is not only a character in its own right, but really shapes the development of the plot. For the paperback release, S&S put together a slideshow of photos by photographer Joan Myers, along with some of the praise for the book. I couldn’t get the darn thing to embed (WordPress being hateful of flash objects), but here’s the link. Happy viewing! 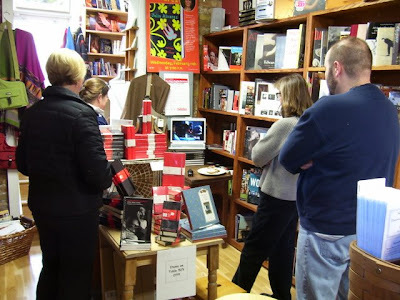 TKE Bookseller Wendy Foster Leigh recently traveled to England (turning us green with envy) and agreed to write it up. Retired English teacher and administrator, she finds nothing more wonderful than having a cat on the knee and a book in hand. 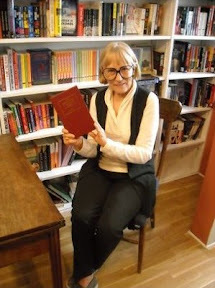 She is an Anglophile and lover of mystery and fanstasy novels–often set in the wilds of Lancashire or Yorkshire. Bookshops are a part of my life. The first bookshop I remember is Halewood & Sons at 37 Friargate, Preston, Lancashire, England. Halewood & Sons, Antiquarian and Export Booksellers since 1867, could serve at the front plate of a Dickens’ novel. Its façade dates back to the 1800s and the banner painted above the upper stories windows says “The Temple of the Muses.” As a child my mother took me each Saturday to the Harris Free Library, the open market, and a bookshop, which was most likely to be Halewood. 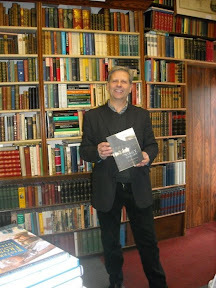 David Halewood, current, 5th generation bookseller, would also have been a child, but his father would have been standing outside on sunny days or inside watching customers on rainy ones. Now, David stands in that same spot. During the past 40 years I have visited the shop on each trip home, and David Halewood is a constant in those visits. 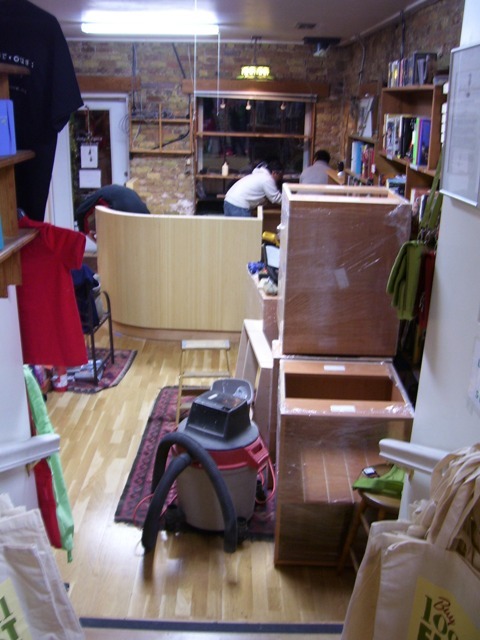 No shelf in the shop is empty and the shelves reach the ceiling. The passages between rooms have books piled up in stacks and the centre of the room is an island of more books. I have never been able to reach the top shelves and am curious as to what treasures are up there. My library contains many Anthony Trollope volumes because they are at my 5’ height. This trip I met a woman in a hurry to find a small volume of poetry for her hour trip on the train to Manchester and overheard a gentleman asking about a long forgotten volume of travel and adventure. I chose my small, leather bound volume of rhyming poetry for its cover, the scribbling of the original owner who was awarded this volume as a school prize, and the music in the words. With such an eclectic array of books, it is hard to imagine the knowledge in the bookseller’s head. 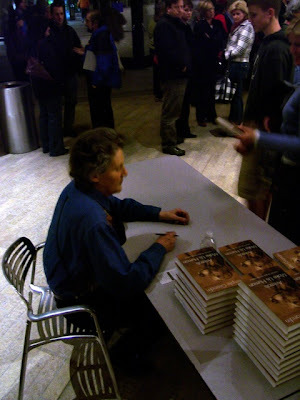 In her groundbreaking and best-selling book Animals in Translation, Temple Grandin drew on her own experience with autism as well as her distinguished career as an animal scientist to deliver extraordinary insights into how animals think, act, and feel. Now she builds on those insights to show us how to give our animals the best and happiest life — on their terms, not ours. We packed the downtown Library’s auditorium — thanks again to the SLC Public Library, the Carmen B. Pingree Center for Children with Autism, and Intermountain Therapy Animals for helping us get the word out. Families, animal lovers, dog trainers, book lovers all, it was a diverse and enthusiastic crowd. We even had some furry friends in attendance! We knew that the event would be big, but I don’t think we knew quite how big. All the staff there were each thanked personally several times by attendees for bringing Dr. Grandin into town. To all of those lovely people and to everyone else who came out, I want to say thanks in return. Without your support at past events, it wouldn’t have happened. So, thanks, and we’ll see you at the next one! Our opening routine got pushed back a little bit by, well, pretty much the most significant political event of our lifetimes this morning. Apparently this inauguration brought out the baker in us. We tuned all our computers, plus a laptop brought in specially, to live coverage and stood witness to the inauguration of the 44th president of the United States, Barack Hussein Obama. There’s really too much to say — how to put it into words? So I will keep it to two: Congratulations, America! If you don’t get InkLinks, our email newsletter, then you haven’t seen our picks for this year! Woe is you, no? But, fear not: here is a photo album of our smiling faces and favorite books. I was lucky enough to spend a fun and educational (in the best way) day with author Sean Connolly last week, when he was in town for a signing of the fabulous Book of Totally Irresponsible Science. As the kid who always found some excuse not to enter the science fair, this book would have been the perfect holiday gift for me as a child. The illustrations are great, the experiments have often hilarious results, and the science is well explained and dramatically demonstrated. Sean was a delight to watch in action; here’s a quick video from one of the school visits. The sound didn’t really take, but you get a great view of not only my favorite of his demonstrations, but of the kids’ reactions to the experiments. The event was so good that we sold out of books and are anxiously awaiting our next shipment. This is a great holiday gift, highly recommended — science at its best. More pictures — almost there!